(CNN) - While national Democrats have been pushing a media strategy against Mitt Romney as a flip-flopper, fellow GOP presidential candidate Ron Paul said the political world is focusing on the wrong person. The more alarming candidate, Paul said, is surging frontrunner Newt Gingrich, a man he labels a "counterfeit conservative." 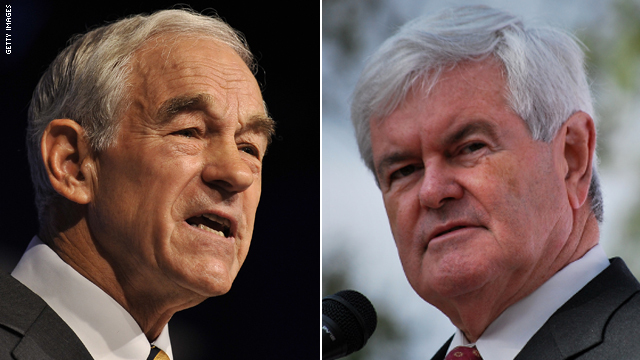 "Most people realize that I keep saying the same thing over again, whereas in (Gingrich's) case, he tries to catch up and change his position to fit the particular time in which he's speaking," Paul said on CNN's "The Situation Rom." Paul released a scathing web ad against the former House speaker on Wednesday, editing a dramatic montage of news media clips to frame Gingrich as a flip-flopper. In a press release accompanying the ad, Paul referred to his opponent as a "counterfeit conservative" who's taken "liberal positions" over the years. He followed up the ad with an appearance in New Hampshire, where he called Gingrich a "flip-flopper" who was getting a "free ride" in the election cycle. "I was more energized to do something when I found these things he had said. I thought they were more meaningful," Paul said. The web ad attacked Gingrich on a range of issues from health insurance to climate change. But Paul said he's most disturbed by the hefty $1.6 – $1.8 million paycheck Gingrich took from Freddie Mac as a consultant prior to the mortgage giant's near-collapse in 2008 and ensuing government bailout. Critics went after Gingrich at the time the story broke, calling him a lobbyist for the mega-lender. But the presidential hopeful has since denied he took part in lobbying of any kind. "He made money off the bailout, you know, if you add up the numbers and put it all together," Paul charged. "So that to me was rather annoying because it was something I worked so hard to prevent." He continued: "It's ironic that the American people are seriously considering that he's supposed to come in and straighten things out. That sort of is bewildering to me." A complete field of nutcases, at least most people realize that Ron Paul is one, which is why he consistently polls so low. Ron Paul is absolutely right. And not only is newt a major flip-floper, he is also a morally-challenged serial adulterer. Why would anyone trust this man for anything, let alone to run our country? "It's ironic that the American people are seriously considering that he's supposed to come in and straighten things out. That sort of is bewildering to me." Bewilders me too! He also is of bad character. Not what people want in a leader. I think people will start to realize he's typical politician ie. a liar. Ron Paul has raised my expectations to the point that I will not vote for anyone else. Please CNN, I'm begging you to give Ron Paul more coverage. He may be our nations last hope. I hope you know that most of Ron Paul's supporters are sick of the way fox news has treated him, And you could get a rating boost by giving Ron a chance. thank you and God Bless.